For some unknown reason taxes and tax optimization has struck my fancy since returning back to work and blogging regularly. Today I wanted to look at some of the benefits of Roth IRA's and why I'm glad that we're finally getting to invest in them again. Roth IRA's are a powerful tool for long term investors. The way Roth IRA's work is that you pay taxes on your income now but once you invest your savings inside a Roth IRA everything is tax free whenever you withdraw the funds. That's tax free capital gains and dividends, at least as the law is currently written. There's no immediate tax break but you reap the tax benefit later on by not paying taxes. For those seeking financial independence that's a huge boon to provide tax free income to get you through the in between years of financial independence and access to traditional retirement accounts like 401ks. Another benefit of Roth IRA's is that you can withdraw your principal after the account has been open 5 years. That might not be the best route for long term wealth creation, but it's a nice benefit to help you through the bridge years if you just can't stand working any longer. A couple months ago I wrote about how my wife and I will be in a lower tax bracket this year due to much lower income. While I always want to maximize my income, the downside to a high income is that we haven't been able to invest directly within a Roth IRA. We would have had to invest in a Traditional IRA first with post tax savings and then convert it to a Roth IRA; however, since we already have tax sheltered accounts (Rollover IRA) this would have triggered additional taxes. So we skipped on Roth IRA funding and focused on building up our taxable accounts. Since we'll be in a lower tax bracket this year I fully plan to invest within a Roth IRA for both my wife and I. For tax year 2015 you can invest $5,500 per person in an IRA. That's $11,000 that we can shelter from any further taxes. If you have the savings/ability to do so, maxing out your Roth IRA is probably the number one thing I'd recommend after investing enough to receive any employer matching within a 401k. The amount of money you can invest within a Roth IRA versus a regular taxable account is no different, but the tax situation is completely different. A taxable account requires you to pay taxes every year on dividends and capital gains if you happen to sell. A Roth IRA never requires you to pay any additional taxes. 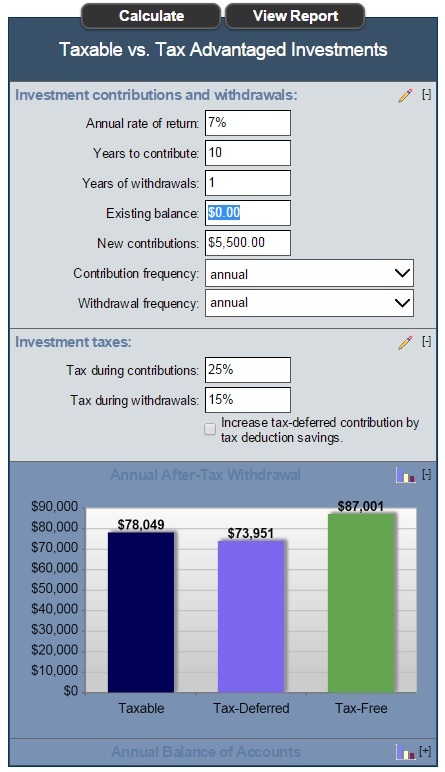 I found a quick calculator to compare the balance of a taxable account versus a Roth IRA (tax free) assuming the same investment returns. You can use the calculator here. With just 10 years of investing $5,500 per year you could potentially be looking at an additional $9,000 just by avoiding paying taxes each year. Unfortunately cash flow has been very tight as we've been getting caught up on everything after essentially being out of the financial loop for the first 8 months of this year. There always seemed to be another $1-2k expense that would creep up each month that would eat into our savings and keep us from investing. The last big expense that needs to be covered is property taxes which are due at the end of January. After doing some sales within our portfolio, for both diversification and tax loss harvesting, as well as receiving dividends and income from writing, we now have our property taxes covered in cash on hand with about a $1,200 surplus. Armed with a $1,200 surplus and additional savings each month we have to try and come up with $11,000 total in order to max out a Roth IRA for both my wife and myself. Thanks to the tax code we technically have until the date we file taxes, due by April 15th, to invest in the Roth IRA. So that leaves us with about 3.5 months to come up with the additional $9,800 that we need. Of course thanks to our FI Portfolio already churning out around $1,500 in dividends each quarter that further reduces the required savings to just $8,300 by the end of March. It could still be tight since my income is quite variable; but my wife is going to start being a full time substitute teacher after the Christmas break which will help provide additional savings. The next thing to conquer is whether we should save and invest it all at once or just invest each month as savings are available. The advantage of investing each month is that we get to build up the portfolio's over time. But the advantage to doing lump sum investing, well lump sum additions of capital, is that many brokerage firms offer bonuses for new accounts. Some of those bonuses are in the form of cash and others are for free trades for a certain amount of time. Either way a bonus is hard to turn down especially if it's worth say $100 per account. That works out to a 1.8% return just by waiting an additional month or two to fund the accounts. Not a bad return at all. I could stick with my current secondary brokerage firm, Tradeking, which offers $1,000 in free trades if you fund an IRA with $5,000. I've also thought about opening an account with Motif Investing. I really like the idea of creating my own ETF with some of the dividend aristocrats, especially those that are hard to invest in at decent valuations. That would allow me to dollar cost average into those positions with smaller chunks of capital rather than investing large sums few and far between. Whether I go with Tradeking or Motif the key is going to be investing tax dollars that are tax free once invested. I'm looking forward to finally building up the Roth IRAs once again after a 3 year hiatus. Loading... *Some links may be affiliate links. If you click on the links and complete the sign up process this blog will earn a little bit of money in return. Make sure to do your due diligence in vetting the possibilities out there as not all brokerages fit every investment type/style. Sounds like a plan JC. One of our goals each year is to put $11k in our Roths. I consider this money to be tax diversification. Someday the government will probably get in such a financial pickle that they start taxing Roths, but hopefully not. I hope you have a great weekend buddy. I think maxing out the Roth's each year is a great strategy. Tax diversification is something I think we all need to focus on more. Ideally I'd like to get about $100k within Roth's and then the 401ks/Rollover would likely be in the neighborhood of $400k by that time with taxable accounts in the $500-600k area. It'll be interesting to see how the government deals with the mess that they're in. I highly doubt that we'll drastically cut spending so that leaves us with the option of staying on the current course or increasing tax rates or quick grabs on 401k/Roths. None of those sound like good options to me. You don't really need to contribute the money for the 2015 Roth IRA until April 15, 2016. As for the 2016 Roth, you have until Apr 15, 2017. I was also wondering, since you will be in a low tax rate for 2015, is it worthwhile to convert the pre-tax IRA into a Roth? I have been maxing out the Roth for 3 - 4 years now. While tax rates are low today, I wouldn't be surprised if they go up over time. As Income Surfer mentioned above, it is good to have some diversification/hedge just in case. Yeah that's one of the weird quirks about our tax code. But it's fine by me because it gives me more time to be able to save up and invest. If we converted the Rollover to a Roth it would add about $2,600 to our tax bill for the year which could make it worth it since it would just be eating into our expected refund. It's definitely something to consider before the end of the year because our taxable and pre-tax accounts far outweigh our Roths. I really only see tax rates going up whether that's income taxes or capital gains/dividends. I mentioned in my response to Bryan that I'd like about $100k in Roths, $400k in pre-tax, and that would probably work out to around $500-600k in taxable accounts. Ideally the Roths would be higher because they're advantageous for tax purposes but I don't expect to be working long enough to bump that up enough. Tax diversification/hedging is pretty important. I'm not as big of a fan of conversions to Roth because for most people you won't gain an advantage. The average Joe stays in the same tax bracket year after year so you wouldn't be able to play tax arbitrage until you are no longer working. However, if cash flow allows you to invest in a Roth IRA each year I'd do so and I'm looking forward to building our Roth's up. JC, i own two roths. One is with Scottrade that deals exclusively in reits and the other is with Edward Jones that deals exclusively with a monthly dividend mutual fund by Benjamin Franklin. So far this year I've contributed $5000 between the two of them. Between the two I made $300 tax free dividends this year alone. I'm more concerned about the government breaking our roth to pay taxes or "changing the rules" like they did in Cypress, Ireland, France, etc. I share your concern that the government will look for a revenue grab and retirement accounts definitely seem like a possibility. My guess regarding the Roth is that it would maybe make everything, less your contributions, taxed at the long term capital gains rate. I don't think they'll completely undo the Roth IRA tax it as if it's all income. If that happens there'd still be a benefit since you would get tax free growth but it'd still be a pain. Big fan of Roth IRA's though and I'm glad to finally get back to investing in them. I wouldn't let excess income dictate whether you contribute to a Roth IRA. It literally takes a few mouse clicks to fund an IRA then roll it over to a Roth. I am a huge fan of Roth accounts. Removing tax uncertainty if the future is a wise move. The reason I hadn't done the backdoor Roth conversion in the years that our income prevented us from doing a regular contribution is because of taxes and it wasn't worth the hassle. We have a Rollover IRA from my previous 401k which is currently around $17,700. I'll just use this year as an example for what we would have happened. 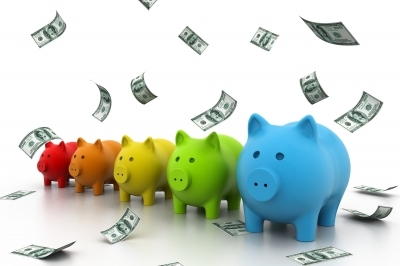 2015 Roth contribution of $5,500 plus the $17,700 from Rollover IRA means total of $23,200. If we wanted to do the backdoor Roth we'd only have been able to get $5,500 / $17,700 * $5,500 = $1,303 into the Roth because you can only convert the ratio of post tax and pre tax dollars. It wasn't a high enough value especially when you consider that we'd been in the 28% tax bracket the past 3 years but expect to be in the 15% bracket in FI. So the math just didn't make sense to trigger a tax event at tax rates that are almost double what we're likely to be in just a few years down the road. Also I do have some concerns that the government will go looking for a money grab in the future so I wouldn't completely bank on the Roth's being 100% tax free after the money is sheltered there. There's always the risk the government will back up on their previous promises.